Mechanical protection against soil erosion is expensive, time consuming and deserve careful thought and planning. However, it plays a very vital role in controlling and preventing soil erosion on agricultural lands. They are adopted to supplement biological methods. The mechanical measures include diversions, terraces, bunding, sub-soiling, basin listing and waterways. A diversion is a channel constructed across the slope to conduct water to a safe outlet. The diversion intercepts or diverts the water which would otherwise flow down from higher elevation. It is constructed either to divert runoff from a hillside to a level bottom field, or for diverting water out of active gullies into a safe outlet Diversions serve as first line defense. The diversions may not be constructed below the cropped area since these deposit sediments in the channels. Terracing is a method of erosion control accomplished by constructing broad channels across the slope. A terrace is horizontal strip of length, either raised or more or less level usually constructed on a nearly on a contour. (Terrace literally means a soil mound. It is a raised level area of ground or a series of raised areas into which a hillside is shaped so that it can be cultivated). It is meant to decrease the length of the slope, thereby reducing soil erosion. Terracing helps to conserve rain water and facilitates tillage operation on sloppy lands. Two principal types of terraces are recognized: broad base terrace and bench terraces. Broad Base Terraces: A broad base terrace is a broad surface channel or embankment constructed on lands up to 10% slopes. 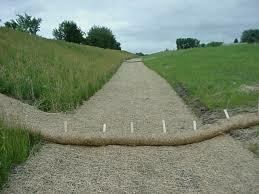 These are useful for reducing runoff erosion and for moisture conservation. Channel Type or Grade Terrace: These terraces are constructed on areas where slope is between 3-10% and the soil is slow in permeability. The embankment is constructed by cutting a shallow channel on the uphill side. This type of terrace reduces the slope length and removes runoff water. Ridge Typo or Level Terrace: This type of terrace is suitable for permeable soils where rainfall is low and the slope is less than 6%. The embankment is. constructed of soil taken from both sides of the ridge. The channel is level and sometimes closed at both ends to ensure maximum retention of water. This terrace is primarily meant for moisture conservation. Bench Terrace: The bench terraces are a series of steps, with horizontal ridge and vertical wall between two ledges which converts a slope of 20 – 30% to a series of nearly level benches. Bench terracing is more common in hilly areas. The steps may be level: (level terraces), have their slopes inward to drain off excess water quickly (reverse slope) or have the slopes outward, e.g., down the hill (sloping terrace). The crops are cultivated on main platforms and grasses and legumes (cover crops) near the banks. In high rainfall areas, the water should not be allowed to attain a velocity so that it erodes the soil, while in low rainfall areas the rain water may be saved and made available crops. The most successful way to control runoff of rain water and the soil erosion is to place a bund across the slope made by using a part of the soil surface itself. Waterways are conservation measures in high rainfall areas with large volume runoff. They carry runoff from watershed and serve without overflow during heavy storm. Waterways may be natural or man-made. The best location for waterways is usually a natural draw where the depth of soil is high and slopes are usually least. In this method, hard subsoil is broken deeply by means of an’ implement called sub-soil without involving the conversion of soil. This process promotes absorption of rain water the soil and makes the soil more looser and fit to allow luxuriant growth of vegetation.